Focus on Fashion: Jane Austen Decoupage Bangles! Too cute! I just love this decoupage bangle bracelet made from the Netherfield Ball scene in Jane Austen’s classic novel, Pride and Prejudice. 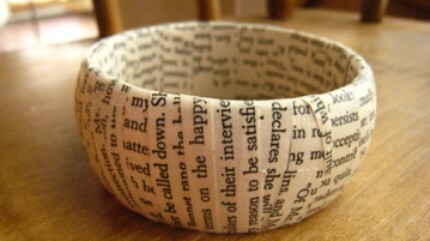 There are a few bangles, crafted from different parts of the book. Just imagine wearing this on your wrist! It would feel so feminine and sweetly sophisticated, like one of Austen’s heroines. $15 + shipping. Don’t you just love etsy?